Steve G. Jones, Ed.D., Clinical Hypnotherapist, charges $1,500 for a custom recording and $25,000 for a one-hour private hypnotherapy session at his office. But you can get all the benefits for this low price. 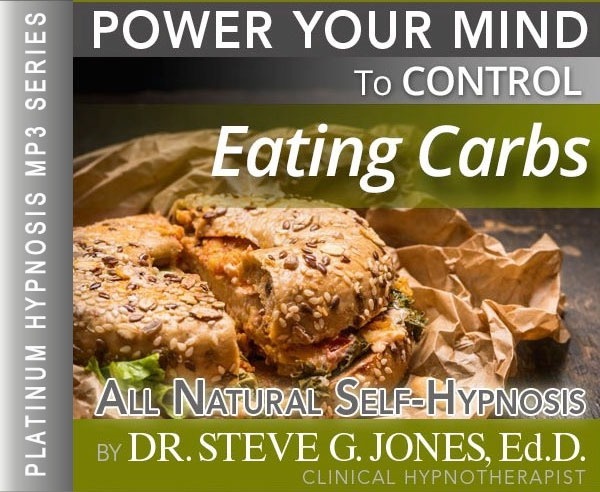 Simply listen to the Control Eating Carbs Hypnosis MP3 every night as you go to bed for three weeks and feel the changes happening in your life. You will feel more empowered, more in touch with your true self, and you will truly know that your goals are within your reach. This Control Eating Carbs Hypnosis MP3 download is the same hypnotic technique he uses with busy professionals, Hollywood actors, and people like you who are ready for a positive change NOW! Steve G. Jones achieves AMAZING and LASTING results!!! Hypnosis is the easiest way to affect change in your life because the positive messages go straight to your subconscious mind effortlessly so you can accomplish your goals and reach for the stars!! All you have to do is listen to the Control Eating Carbs Hypnosis MP3 audio at night as you go to sleep!!! You’ll hear soft music, the gentle sounds of the beach, and the soothing sound of Steve G. Jones’ voice all working together to bring about positive changes in your life easily and naturally. Steve G. Jones has been helping people improve their lives with hypnosis for over 17 years…now it’s time for him to help YOU… don’t wait, do it NOW !!! you’ll be glad you did. See you at the top! And as you continue relaxing deeper, and deeper and more deeply relaxed, I would like you to imagine a table filled with all the carbohydrates which you formerly ate. Look at this table now and notice that they are beginning to look rotten and moldy and old and completely unacceptable to you. And on a scale from one to ten, one being the least acceptable and ten being delicious and highly acceptable, I would like you to now imagine that these carbohydrates are an eight. They are beginning to turn now. They’re beginning to lose their freshness, now a seven. They are beginning to look more and more disgusting to you. And now a six. As flies begin to gather and land on the various carbohydrates on that table. And now a five, they have become inedible. You cannot eat those carbohydrates. Now a four. They are rotting, they are decomposing. Look at all the carbohydrates on the table. Look at each one individually. Notice how disgusting they are. And now a three. Those carbohydrates are no longer food. They no longer interest you. They are thoroughly disgusting to you. Your body rejects them, they stink, they are not food for your body. Now a two. when I reach the next number, those carbohydrates will simply be masses of mold and now a one. They no longer resemble carbohydrates. They look like masses of mold on that table. Flies have gathered on the table as well. Now you push that table away from you because you could not imagine eating any of those carbohydrates. They are disgusting and this is how carbohydrates will seem to you from now on, thoroughly disgusting and unacceptable. Carbohydrates no longer seem to be food. They seem to be unacceptable lumps of mold. So you are no longer entrusted in eating carbohydrates. Your body rejects carbohydrates. And I want you now to breathe in deeply and as you do, breathe in a sense of confidence and relaxation and hold that breath, open your mouth slightly and exhale. And as you exhale, exhale any cravings for carbohydrates, let them go. And as you breathe in deeply again, breathe in relaxation and calm peace of mind. And as you exhale slowly through your mouth, exhale any last bit of cravings for carbohydrates, let them go, let those cravings go. As you continue breathing easily, effortlessly and naturally, realize that you no longer have an interest in carbohydrates. They are a thing of the past for you. Your body rejects these and does not accept them as food. You are free your craving for carbohydrates. Instead you choose other foods which you desire. So I would like you to relax deeply now and realize that everything is going to be just fine. You can train your subconscious mind and your conscious mind to no longer crave carbs! Hypnosis works by targeting your subconscious mind and giving positive and powerful suggestions. Your subconscious mind then tells your conscious mind that you do not want to eat carbs. This is how hypnosis will help you to stop eating carbs. You can reprogram yourself to no longer want carbs. Realize that it is important for your body to get some carbs, and this program will allow you to eat healthy carbs that give your body sustained energy. We suggest you listen to the Control Eating Carbs Hypnosis MP3 recording for 21 days in a row to rid yourself of eating carbs. In three short weeks, you can drastically reduce your carb intake without even trying. You will no longer crave carbs!